Till the time when the transmission voltages were about 220 kV and below, over-voltages due to lightning were of very high order and overvoltages generated inside the system were not of much consequence. In later years, with increase in transmission voltages (400 kV and above), the overvoltages generated inside the system reached the same order of magnitude as those of lightning overvoltages, or higher. Secondly, the overvoltages thus generated last for longer durations and overvoltages, the switching and other types of overvoltages depend on the normal voltage of the system and hence increase with increased system voltage. In insulation co-ordination, where the protective level of any particular kind of surge diverter is proportional to the maximum voltage, the insulation level and the cost of the equipment depends on the magnitudes of these overvoltages. In the EHV range, it is the Switching Surges in Transmission Line and other types of overvoltages that determine the insulation level of the lines and other equipment and consequently, they also determine their dimensions and costs. The making and breaking of electric circuits with switchgear may result in abnormal overvoltages in power systems having large inductances and capacitances. The overvoltages may go as high as six times the normal power frequency voltage. In circuit breaking operation, Switching Surges in Transmission Line with a high rate of rise of voltage may cause repeated restriking of the arc between the contacts of a circuit breaker, thereby causing destruction of the circuit breaker contacts. The Switching Surges in Transmission Line may include high natural frequencies of the system; a damped normal frequency voltage component, or the restriking and recovery voltage of the system with successive reflected waves from terminations. The waveshapes of Switching Surges in Transmission Line are quite different and may have origin from any of the following sources. De-energizing of transmission lines, cables, shunt capacitor, banks, etc. Disconnection of unloaded transformers, reactors, etc. 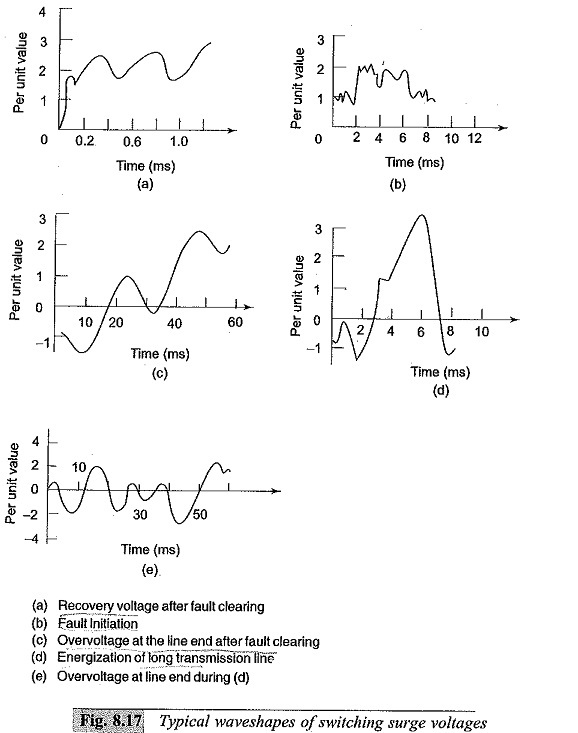 Energization or reclosing of lines and reactive loads. Sudden switching off of loads. Short circuits and fault clearances. Resonance phenomenon like ferro-resonance, arcing grounds, etc. Typical waveshapes of switching surges are given in Figs 8.14a to e.
From the figures of the switching surges it is clear that the overvoltages are irregular (oscillatory or unipolar) and can be of high frequency or power frequency with its harmonics. The relative magnitudes of the overvoltages may be about 2.4 p.u. in the case of transformer energizing and 1.4 to 2.0 p.u. in Switching Surges in Transmission Line. interruption of small capacitive currents, such as switching off of unloaded lines etc. energization of long EHV or UHV lines. by conducting field tests to determine the expected maximum amplitude of the overvoltages and their duration at different points on the line. the effect of line parameters, series capacitors and shunt reactors on the magnitude and duration of the transients. the lightning arrester sparkover characteristics. It is necessary in EHV and UHV systems to control the Switching Surges in Transmission Line to a safe value of less than 2.5 p.u. or preferably to 2.0 p.u. or even less. limiting the overvoltages by using surge diverters. The first three methods, if used properly will limit the switching overvoltages to 1.5 to 2.0 p.u.